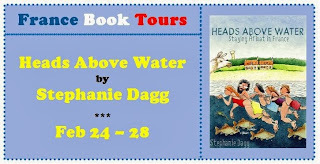 Welcome to ‘France et Moi’ where this week I am talking to author Stephanie Dagg about what France means to her as part of a virtual book tour organised by FranceBookTours for Stephanie’s memoir Heads Above Water . You can read my review of Heads Above Water here. 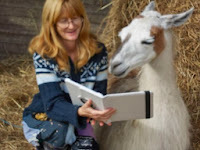 Stephanie lives with her family on a 75-acre farm in rural Creuse, running a gite, carp fishery and llama trekking business. She manages to fit her writing and freelance editing around family life, farming and renovating a 200-year-old farmhouse. I have virtually known Stephanie through blogging for many years and would love to sit and chat to her over a coffee, but for now I will have to make do with asking her a few questions here. Firstly, I think France is a special place and it is famed for many things including its cheese, wine and diverse holiday locations plus, dare I say it strikes and dog poo littered streets. What do you think makes France so very unique and ‘French’? Steph: For me, experiencing France from a rural perspective, I think it’s space and time. We live in Creuse, one of the least densely populated départements of France, with lots of scattered farms, small villages and a few large towns. On top of that we have a 75-acre farm to ourselves (and something which we would never in a million years been able to afford back in Ireland) and our neighbours are all distant specks on the landscape! And as for time, yes, we have to keep an eye on the clock during term time since there’s the school bus to deposit our youngest on and retrieve him from. But time is more fluid here. There’s always time for a few words with the bus driver, people in the village and local town when we pop there on errands, anyone who drops by. If something can’t be done or finished today, then there’s always tomorrow. Plans can be changed. 2) What is your fondest memory of time spent in France? Steph: Before we moved here, we had many fun family cycling holidays, so those are the best memories – cycling along tree-lined avenues, coming across life-saving cafés in the most unlikeliest of places and generally enjoying the great outdoors. 3) Having lived in France and spoken French for many years do you have any top tips for my readers on how to learn French? Steph: Listen to how the language sounds and copy that, but most of all just have a go at speaking the language. If you make mistakes, it doesn’t matter. It really is the only way to learn. Jump in at the deep end! 4) You are a Mum of three, and have seen all stages of the French education system and the Irish one too. How do you rate the French system? Steph: I’m a huge fan. My kids have spanned maternelle to university now. We’ve gone the state school route and it’s proved excellent. They cover a wide range of subjects, although I do wish there was a bit more creative writing fitted in along the way. There are school clubs and trips at all levels, and youngsters are encouraged to go to study beyond the Bac i.e. go on to university or to other places of training and learning. Uni perhaps is more like an extension of lycée, at least initially, in that it’s more test-based than a UK or Irish university but both my older two will be able to study abroad through the Erasmus and other programmes. And most importantly of all, there’s financial support for students. No getting ridiculously into debt. 5) As well as writing you are a Llama Farmer, what attracted you to llamas and do you eat them or use their fleece? Steph: There are some I wouldn’t mind eating when they decide to go walkabout or lean against the fence and break it! Only joking – they’d be very expensive snacks. As for using the fleece, it’s on my to-do list. I have a spinning wheel but, despite going on a course, I’m still struggling with that a little. I’ve used small quantities for felting and stuffing, but since llamas don’t actually need to be shorn, and we only do our alpacas (I have about seven alpacas) every two years, there’s not too much of a wool stockpile. But there are rather more sacks of wool lying around than I have space for! 6) What is your favourite thing to buy in a Boulangerie/Patisserie? Steph: Do you know, I’m not actually a great one for the fancy buns. I usually indulge in a pain aux raisins, or a pain au chocolat. However, you can tempt me from time to time with a mille feuilles though. Yum. 7) France has many different cheeses, a silly question, but which French cheese are you? Steph: Blue cheeses are far too scary for me! I’m very partial to Cantal jeune (a hard cheese) and cream cheese with figs and nuts in. The cheese we eat most in our house is grated Emmental – I buy it in huge bags. 8) If money and commitments were no object where in France would you like to own a property and what sort of place would it be? Steph: My very favourite part of France is Cantal, and my husband’s is the Auvergne so we’d have to find a small, old house with a huge garden in between their respective volcanic ranges. However, with a farm full of animals, travel is something we can’t do these days, at least not together! Finally, do you have any current projects you would like to tell my readers about? (I’m hoping for a sequel to Heads Above Water). Steph: I have made a start on Total Immersion, which is the sequel to Heads Above Water . And I’m also tempted by a look at Belle Epoque France, inspired by all the magazines and newspapers of that period that we found in the attics of the houses here at Les Fragnes. I have a number of novels on the go too. I’d like to get something finished this year, but the busy season on the farm and with our gite and fishing lakes is about to start so creative time tends to be hard to find. But I will make a big effort. Thank you for taking the time to answer some questions about France and you. You can read more about Stephanie’s life in France on her blog here, find her on Twitter here and here and Facebook here. 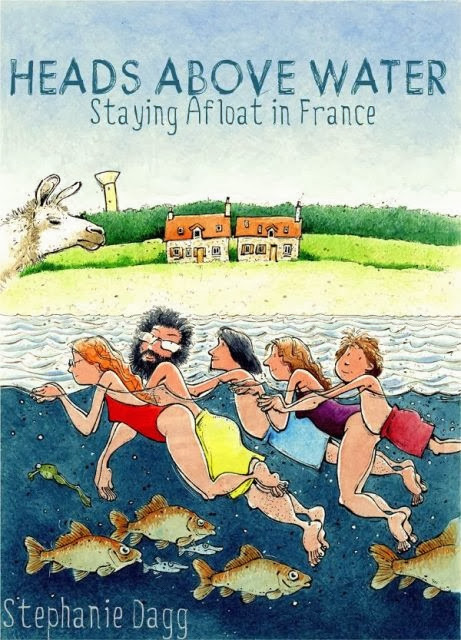 If you haven't yet read Heads Above Water, please do, it is a very funny account of life in rural France.